It was a rainy afternoon in Milford Sound National Park, New Zealand. We had spent the morning on a boat staring with our jaw to the floor and our eyes gazing up; the landscape looked as if we had entered another world. I had heard of this place, even seen pictures… but experiencing it in real life didn't quite feel like "real life". The tree-covered mountains were jetting out of the ocean, kind of like the world had been flooded again and we were voyaging through a water maze. I can see why they call it one of the wonders of the world. I honestly wouldn’t have even thought twice if a few pterodactyls came flying around the bend of the mountainous gates. That evening we had planned on "stealth camping" up at a spot we had heard about called Lake Marian. Apparently, this lake had the clearest water in all New Zealand… right when I heard those words: Clearest and water I was sold. An alpine lake with snow caped mountains surrounding and water that you'd accidentally step in because you couldn't tell if you were on dry ground or submerged. I was SO unbelievably into it. We parked the car at the trail head, packed our bags, got distracted by some Americans we met and almost got eaten alive by sand flies while talking to them. We were supposed to leave at 6pm to get there and have some time before dark but we didn't leave until 8pm… luckily NZ is crazy and it doesn't get dark until 10pm at night. Our new American friends (who by the way, we saw THREE different times in three different places, one being on our plane ride back to the states) told us about how the trail was steep and muddy; judging by their dirt caked legs I could see they weren't exaggerating. Though it was late and we had to muster the courage to start hiking after a long day, we both agreed the lake would be worth it. Our destination would be so worth it. My Uncle contacted me a few weeks ago asking to write a short story for his new book. I was very flattered that he would request that of me and so I got to thinking about experiences I've had in life that feel special; times when words fail and I'm left with only memories. I'm extremely excited to see what he comes up with and I'll be sure to share the information when it's published. This is an attempt at me trying my best to put words to a life moment that really shouldn't have an explanation. I hope you can resonate a bit with me. Sometimes life presents us with experiences that we can't really explain. Moments we can remember so vividly but rarely have words to describe the feelings that emerge with those thoughts. There's an old Celtic Christian idea that describes a space we as humans can step into where the barrier between heaven and earth simply collapses. They call this a thin place; a place where life feels right and the beauty surrounding us seems almost too much to bear. This is a locale I enter into often and I believe it's a place where God meets me. Not in a condemning way or fearful way but more so a way where I feel embraced. Picture a cold day in the mountains; you step outside and all of a sudden the frigid air hits your skin. The breeze latches onto every bit of you and your body reacts with small bumps to hold in its warmth. Then, in that moment, a dear friend brings you a warm wool blanket; they drape it over your shoulders and pull you in tight. You see your breath escape your mouth, as if you were smoking your grandfathers old pipe. Your skin receives the blanket and sure enough the warmth grows into something greater. You feel the heat expand and your comforted once more. It has been over two months since the last time I wrote a post and my time in Hawaii has come and gone… crazy. To all of you who helped me along this journey, wow. Thank you. I apologize for being so off the grid but I truly appreciate all of your support, y'all are the best. If I've talked with you via phone call or text in the last 90+ days I've probably said something along the lines of this sentence, "This experience has been interesting and I'm SUPER busy but it has been good." Which it has. It's difficult to explain what I've been up to in Oahu. It was definitely not what I expected but that’s how most of life goes right? Things happen that you don't really expect. Now don't get me wrong, I love talking about "Jesus stuff" but I would be bummed if y'all thought I created this blog only to share my faith or share my idea on how the world works. And trust me, there are many stories to come that have nothing to do with my opinion on spirituality. BUT... this morning will be about just that; the spiritual stuff. And it won't be a cool, pretty picture. There are things or realizations that I have in life that I cannot simply sweep under the rug. I hope to share some of these with you, not asking you to agree but to maybe think about them on your own terms. This quote rings true for me. I love C.S. Lewis, not just because he writes incredible books but because the things he says make me sit and think. This quote requires some sitting and thinking... my faith is what holds me together; to put it very vaguely. You hear it over and over in Christianity: Jesus teaches us that life has purpose greater than what we can come up with. Whatever I conjure up in my mind pales in comparison to what the Lord intends for me or has created in this universe. Again, these are the things I think about when reading about the life of Jesus. He goes against the grain of society and asks people to look deeper into the meaning of life. Yesterday there was a winter storm warning. 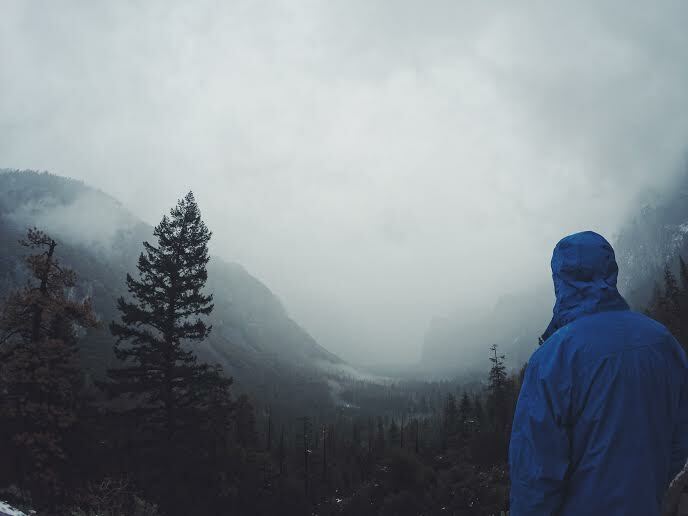 What better kind of weather could you ask for on a day you were going to visit Yosemite Valley? It was our last weekend to head down to the valley before leaving for the holiday season, and it was personally my last time to see it until the spring. We could've gone a much safer, less snowy way but we had to see Tunnel View. If you've never been to Yosemite this is probably the picture you've seen of this place. Vast granite walls guiding your eyes down into a valley topped with pine trees. Flat meadows leading up to rock faces that shoot up 3,000 feet instantly. It truly is a sight to see. The rain started falling and the dense fog hung over the trees so you couldn't even see the top. It was as if the mountains were ascending to the heavens and we were gazing up at them from the bottom. We soon came to the realization that tunnel view wasn't actually going to be it's normal awe-inspiring picture. The tiny car slowly rolled it's way into the snow and ice covered parking lot and we slowly made our way out, slipping and laughing as we walked over to the classic "tourist spot". This is a spot I've stood in many times through out the past few years. This spot will always hold a special place in my heart. I remember the first time I drove into the park with some of my closest friends from Texas and we stood there drooling over the giant landscape. We even got pulled over by a ranger because we were hanging out of the sunroof, blasting music and totally geeking out over how big everything was. I remember visiting this place on days off when I worked at a summer camp near by and we would spend the whole time in the sun climbing until we were too tired to move. I remember coming here all alone and simply crying over the beauty and needing a place of rest -- a sanctuary to sit in. I hope this view never gets old. I find myself taking a photo each time as if a picture will capture this place and save it forever. I know I'll find my way back here in a few months and though I will have changed as a person, this place stays constant. It will always be a home. I've never "blogged" before, or even thought much of sharing stories via the world wide web. Heck, it feels a little strange... but I'm a verbal processor and enjoy writing a fair amount. Lately I've found that I've been needing to process life changes and seasons more frequently. So, if you're like me and you have no idea what tomorrow might hold and life feels crazy 99% of the time... then maybe you'll relate with some of these thoughts. OR maybe you like reading and you find joy in hearing crazy stories, near death experiences, semi-embarrassing moments and flat out moments of pure confusion, well, then maybe this word vomit page could bring you some excitement and laughs; though, bare with me... I'm no English pro or grammar expert. Traveling Words. That's what this will be. Feel free to keep up with this whirlwind of a life I try to lead or please contact me if you want to chat about any of these rambles! I seriously hope this can be a space of vulnerability, growing, challenging and any other ridiculous descriptions you can think of. I will try and update this often; I sure hope you enjoy it!